Like every year, it is now time to review the popularity of TV shows to spec. Dedicated posts will be made respectively for the best comedies (half-hour) and the best dramas (one-hour). As the title says, this post is all about the dramas. In addition, you’ll also find (when available) a script for the corresponding show for educational purposes only. Canceled or dead shows have been removed since last season’s spec list. In addition, you’ll also find (when available) a script for the corresponding show for educational purposes (title will be in red). – An asterisk (*) any series that will not be accepted by WB. – A dagger (†) any series that will not be accepted by NBC. Any public update will be reflected on this list. There is also a grade regarding the show’s longevity in relation to its speccability. Meaning, how long can you keep your spec script fresh without having to throw it in the trash? 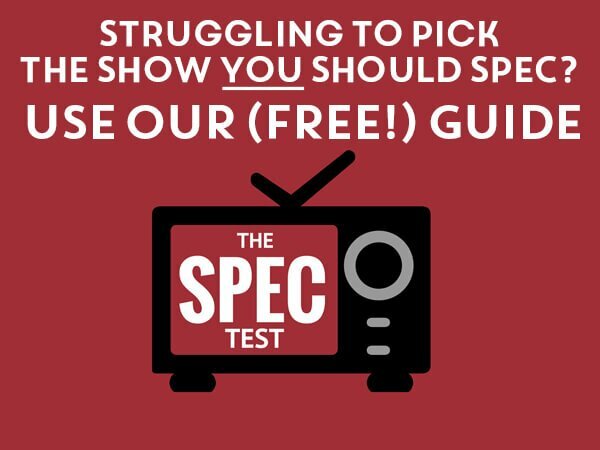 Re-tool your spec if you have one, but you probably shouldn’t bother beginning a new one for these shows. Longevity: ★★★★★ – Humanity destroying itself is a repetitive cycle. A show trying to reinvent itself with one final time jump. Longevity: ★★★★★ – It’s the last season either way. Longevity: ★★★★★ – In season seven, filmed back-to-back. Thanks to contract negotiations. An anthology with little rhyme or reason. Longevity: ★★★★★ – How can you write a spec for this? Years of popularity have led it to be a classic pick. Longevity: ★★★★★ – An end is just a beginning. Still a choice for your traditional premium cable character drama. Longevity: ★★★★★ – Will you distinguish yourself from all other Sauls? I challenge you to use a lighter and a candy bar in your spec. Longevity: ★★★★★ – Even better if you make them explode. Writing a pilot might be a better option at this point. Longevity: ★★★★★ – There’s no real longevity for something that can easily be a standalone original. Longevity: ★★★★★ – Reveal a secret new tattoo. With a name like that, you’d think we were talking about a dishwasher. Longevity: ★★★★★ – But it’s a cop drama, so you’re better off. Longevity: ★★★★★ – …but with spin-offs on the way in. Did you know the size of the brownstones on the show were praised by some critics? Longevity: ★★★★★ – No comment. Longevity: ★★★★★ – Wait for the prequel. Longevity: ★★★★★ – ‘Tis the end. They’ve transcended the notion of case of the week. Longevity: ★★★★★ – On and on and on and on. Accepted by middle-America, not accepted by most writing programs. Longevity: ★★★★★ – Both always speccable and never speccable. Take one last bite out of it if you can, otherwise don’t. Longevity: ★★★★★ – It’s the final countdown. Is this the walk of shame I’ve heard so much about? Longevity: ★★★★★ – It’s Showtime so Ray will probably last for another decade or two. Longevity: ★★★★★ – Write about your next D&D campaign. Longevity: ★★★★★ – Tune in for the Gina Torres spin-off. It’s a soap opera with blood, what more could you ask for? Longevity: ★★★★★ – Coherent plot? The current and new widespread shows in town that are getting read. Mixed reception for both, but that brings a lot of potential. Longevity: ★★★★★ – They’ll continue being on thanks in part to the press they get. Email me for my Venmo. Longevity: ★★★★★ – Make it rain. Longevity: ★★★★★ – Merryl Streep will get an Emmy and the episodes haven’t even aired yet. Is this a show about the vital force forming part of any living entity in traditional Chinese culture? Longevity: ★★★★★ – Wait, wrong pronunciation. Can’t wait for Chicago Endgame. Longevity: ★★★★★ – Thanos was awesome. A refreshed cast with refreshed stories. Longevity: ★★★★★ – Will last as long as the Queen’s reign. In a manner of speaking. Huge gaps between seasons allows it to maintain its position. Longevity: ★★★★★ – We shall see how long that lasts. Longevity: ★★★★★ – AMC isn’t afraid of money. Big shows, yet one ain’t a go-to. Longevity: ★★★★★ – An OTT trying to define its impact, meaning they’ll be picked up until the creatives have had enough (or they get too expensive). Too depressing for me to watch. Longevity: ★★★★★ – Also too real. Fun action drama which is sadly not as accepted as it should. Longevity: ★★★★★ – Writing those fight setpieces might be complicated though. Longevity: ★★★★★ – Excited for the second season. The now-established major forces of the DCWU. Longevity: ★★★★★ – Might be their last season at this level. One of multiple devil-based dramas on the air. Longevity: ★★★★★ – Brought back from the dead by an OTT. Never reached the popularity of The Good Wife, but still endures. Longevity: ★★★★★ – If only she became president. One of the best shows on the air, hands down. Good luck writing that dialogue. Longevity: ★★★★★ – No reason to think Amazon is going to get rid of its golden show anytime soon. Longevity: ★★★★★ – Was able to spin itself off, so it can probably go on for a bit. Longevity: ★★★★★ – Six years later, and another season a long ways away. Seven are expected in total. Longevity: ★★★★★ – Find the missing episode. Longevity: ★★★★★ – A single-tear is forming down my cheek. Abstract metaphysical algorithmic artificial machine learning intelligence. Longevity: ★★★★★ – It took a while for season two to appear. You have some time before year three. Not quite fully widespread but will get there given the chance. Longevity: ★★★★★ – No end. Longevity: ★★★★★ – The closest thing to a bubble show out of that group, but still got a renewal. Another batch of network procedurals not read or accepted widely. The shift is almost complete. Longevity: ★★★★★ – Don’t be afraid of cancellation. Be afraid of innapropriate behavior. Longevity: ★★★★★ – Already renewed deep into our lives. Longevity: ★★★★★ – Renewed and no real dips in sight. A potent combination of soap and grit. Longevity: ★★★★★ – Second season incoming with the first having great ratings for the network. Always on the cusp of breaking big. They have the potential reach. Longevity: ★★★★★ – As they continue to age, they may never get the chance. He’s both good and a doctor. Longevity: ★★★★★ – Ratings hit and medical drama means long-lasting. Longevity: ★★★★★ – A network dramedy lauded by critics isn’t usually a recipe for everlasting success. Longevity: ★★★★★ – They’re both getting long in the tooth, which could force OWN to find other headliners soon. Like a prequel to an origin story. Longevity: ★★★★★ – It’s Syfy so it could be both renewed and cancelled. Longevity: ★★★★★ – …adaptation + unreliable schedule + serialization + minimal episode orders. A one-hour with a lot of comedy makes for a half-decent pick if you need a transitional spec. Longevity: ★★★★★ – Likely on its way out. One of the few cable sci-fi shows more commonly accepted. Longevity: ★★★★★ – Perhaps you can add depth to the narrative. Longevity: ★★★★★ – Second season still incoming after a two-year wait. Gap show. Finally read after several seasons undervalued. Might be too little too late. Longevity: ★★★★★ – Starz is trying to bring forth its next generation of dramas. Ball culture is great, the yuppie story not so much. Longevity: ★★★★★ – The serialization might prove trouble, but you have room to improvise. One man’s quest to find something else. Longevity: ★★★★★ – Low ratings might mean an end after the fourth season. Vicious, quippy dialogue. Brings me back to the days of The Thick of It. Longevity: ★★★★★ – A second season is still to be dated, so cash in now. The shows (mostly cable) you may be tempted to take a risk on, getting you on top of the reading pile. Beyond that, it depends on the willingness of the reader and his/her knowledge of the show. For some reason, serialized science-fiction and fantasy from Netflix doesn’t translate to readership in the spec world. Longevity: ★★★★★ – But given the gap between seasons, you’ve got the opportunity to write something that’ll last for a bit. Longevity: ★★★★★ – One has had massive behind-the-scenes turnover, the other just got canned. Now is the time to make some animal sounds or something. Longevity: ★★★★★ – Might be in its fourth season but with a stable audience, there are still options. Longevity: ★★★★★ – …can you guess who he’s going to protect next? Not to be confused with Casterly Rock. Connect the superhero’s problems with an internal family struggle, and you’ve got a recipe for success. Longevity: ★★★★★ – How many issues of the comics are there? Longevity: ★★★★★ – Barely based on the book, you have ample room for story. Eric Bana got traded for Joel Kinnaman. Longevity: ★★★★★ – Amazon poured too much money to let it go this easily. Half-hour dramas are becoming all the rage. Longevity: ★★★★★ – Livin’ la vida loca. The setup to the new DC Universe. Longevity: ★★★★★ – New network, new gamble. For one reason or another, these are much riskier specs to do right now. You have been warned. The show is weird. Alan Tudyk is a villain. Highly recommended. Longevity: ★★★★★ – Lean into the self-referential. Quality hard sci-fi. I’m here for it. Longevity: ★★★★★ – Thankfully got saved by Amazon, which means it’ll probably last a hot minute. Heads-up: it’s not a fix for that bug in your operating system. Longevity: ★★★★★ – Hard to predict off a couple of episodes. Not based on the novel Push by Sapphire. Longevity: ★★★★★ – Mid-season genre shows will always be at risk (and one of the three is already cancelled). All hail our binge deity. Longevity: ★★★★★ – Too new, too fresh, too too. A true Star Trek:TNG heir which is actually not that read. Longevity: ★★★★★ – Long season gaps and procedural elements last for a while. A gigantic 109 (!) dramas are analyzed on this year’s TV spec script list (compared to 104 last season). We keep expanding the definition of “too much television”, even though, like with half-hours, we’re seeing a level of stagnation. The breakdown of content between network, linear cable and OTTs is also fairly even, with respectively 39, 37 and 32 dramas for each. Last year saw new entrant CBS All-Access, and this time we have DC Universe. It’s likely that our 2020 drama list will feature even more OTT players (Disney+, Apple+, etc.). They still don’t have more offerings than linear channels when it comes to spec opportunities, but that will undoubtedly change in years to come. Sci-fi, fantasy, and superhero dramas also have a strong showing, which proves the staying power of genre television. That doesn’t mean they’re as widely read as their more “traditional” drama counterparts. In particular, overt science-fiction series from cable and OTTs (The Expanse, Altered Carbon, The OA, Legion, Star Trek) seem to not get the reads they should. Hard to tell if this trend will continue. Like last year, we’re continuing to see the popularity of anthology series winding down. However, we’re only months away from new OTT offerings in that format, so things may change soon. Overall, it’s a whole lot of TV drama on a whole lot of TV platforms. Fragmentation of content may mean more opportunities for some, but also more safe bets on tried auspices. Knowing your voice — and finding the right show to spec to fit that voice — is as crucial as ever.